'Florence Nightingale' (Lowell Baumunk, R. 2003). Seedling# 782E. TB, 36" (91 cm), Midseason bloom. Dark red purple self; beards orange. 'Horatio' X 'Night Game'. Iris Colorado 2003. Honorable Mention 2005. From AIS Bulletin #328 January 2003 Introducing FLORENCE NIGHTINGALE TB. The colors tell the story: In the dark of the night, her orange lamp offered hope and caring. Seedling 782E. Mid-season.36". A very smooth, very dark red-purple self with prominent orange beards. Well branched. Seven buds. Strong purple based foliage. 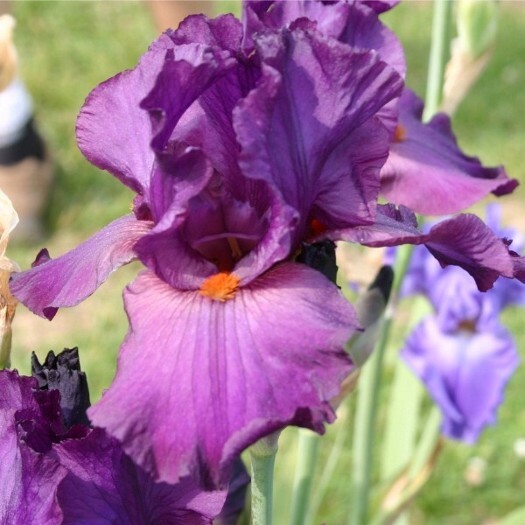 FLORENCE NIGHTINGALE was named by Nurse Practitioner and Iris Enthusiast, Karen Tomky, of Olney Springs, Colorado, to honor the nursing profession. Karen was one of six nurses who received the prestigious 2001 Nightingale Award given by the Colorado Nurses Foundation to honor nurses for excellence in caring. For each rhizome sold this year, Karen will make a donation of $5 to the Colorado Nursing Foundation for nursing scholarships. In addition, all nurses who are A.I.S. members maypurchase Florence Nightingale for $20. EC. Denver 2002. (Horatio X Night Game). $40 postpaid. Iris Colorado. jpg florence_nightingale_(1)-X2.jpg manage 313 K 18 Feb 2016 - 23:02 BrockHeilman Please contact Brock Heilman for image use.